The second name of the painting – “The Wonderful Spring”, traditionally preserved in Russia, dates back to the catalog of the exhibition-sale of Gauguin 1895, which was probably composed by the artist himself. Meanwhile, the Tahitian name inscribed on the canvas is translated differently. Georges Wildenstein interprets it as “Joy of rest”. Bouguer and Dani-elsson proposed more precise versions: “Sweet Dreams” or “Sweet Dreams.” The painting refers to the period between the two visits of Gauguin to Tahiti, which was performed in early 1894 in Paris as a memory of Oceania and all constructed from images of the first Tahitian period. Richard Field suggested that the sculpture of a double Tahitian deity represents the supreme god Taaroa and one of his wives. 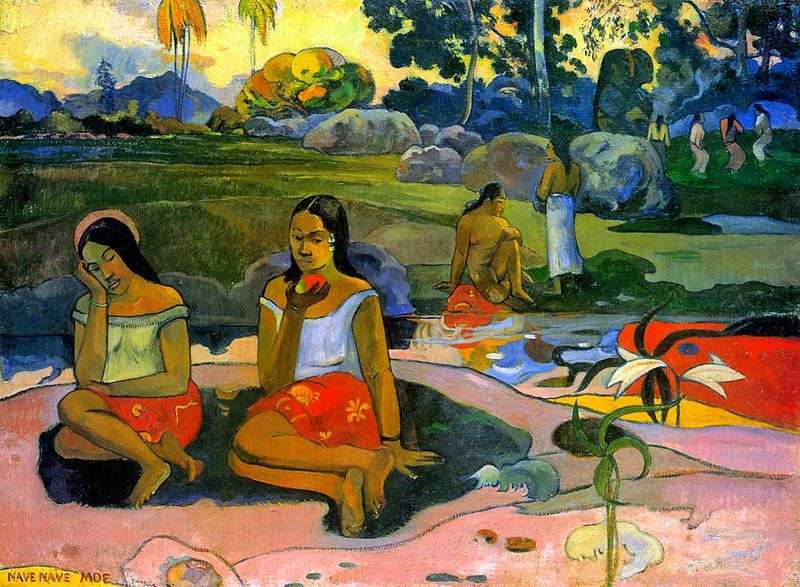 The picture that most of all relied on Gauguin when creating the “Wonderful Spring” was “Women on the River Bank”. This canvas is executed in a rather impressionistic manner, from which the artist refused, going to the stylized generalizations of the synthetic composition, impregnated with religious ideas of a special property. The need to express these ideas and led to the inclusion in the landscape of a double idol and to the room in the foreground of the Virgin Mary and Eve with an apple, depicted in the form of Tahitians. Description and meaning of the painting A Wonderful Spring (Sweet Dreams) by Paul Gauguin.